To continue with our Fourth themed week I bring you a grilling Tasty Tuesday! I have been looking for a new and different alternative to your average beef patty burger most of us consume on any given summer day, especially the Fourth. I cannot wait to be reunited with our grill and a friendly gathering that encourages usage. Here is a recipe from Real Simple Magazine worth trying. My mouth is watering thinking of it. I don't know about you guys but I have never thought about buying ground pork. And especially haven't thought about pork burgers. Well, now we all have! This burger also has one of my favorite ingredients. Fennel seed. Be sure to check the tip at the bottom left of the recipe page to learn how to crush the seeds for this tasty combination. Be sure to cool down after this spice burger with Laurie's watermelon salad or the Garden & Gun Granita recipe I shared. Heat grill to medium-high. Once it is hot, clean the grill grate with a wire brush. Just before grilling, oil the grill grate. Mix together the bell peppers, onion, oil, and ¼ teaspoon each salt and black pepper in a medium bowl until coated. Grill, covered, turning occasionally, until the peppers are charred and tender and the onion is tender, 5 to 7 minutes for the peppers and 12 to 14 minutes for the onion. Scrape the charred skin from the peppers with a paring knife and wipe clean with paper towels. In a second medium bowl, gently mix together the pork, fennel seed, crushed red pepper, garlic, ½ teaspoon salt, and ¼ teaspoon black pepper with your hands until just combined. Form the pork mixture into four ¾-inch-thick patties. Use your fingers to make a shallow well in the top of each patty (this will prevent overplumping during cooking). Grill the burgers until cooked through and an instant-read thermometer inserted in the center registers 145° F, 8 to 10 minutes per side. * During the last 2 minutes of cooking, top the burgers with the provolone and cook, covered, until melted. Grill the buns, split-side down, until toasted, 10 to 20 seconds. 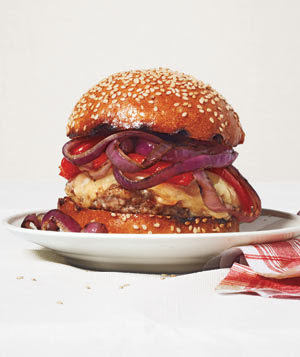 Stack the burgers, peppers, and onion between the buns. *This recipe includes the Real Simple test kitchen’s preferred cooking temperatures (considered safe by many experts) for burgers cooked to their juicy best. For maximum food safety, the U.S. Department of Agriculture recommends temperatures of 165° F for poultry, 145° F for fish, and 160° F for ground beef, lamb, and pork.